Cliff Flamer, MS, NCC, NCRW, CPRW and CEO of BrightSide Resumes, is a preeminent career counselor, resume writer, and job-search coach with a background in recruiting. He has been writing resumes and coaching job seekers on their approach for over 2 decades in Silicon Valley and the San Francisco Bay Area. Cliff leads a smart, positive, lean team of editors and administrative professionals who fully embrace the BrightSide and are masters in their own right. Winner of the esteemed "World's Best Resume Writer" competition (People's Choice Award), earning top votes from a seasoned hiring panel of HR specialists, recruiters, executives, and fellow resume writers, as well as from thousands of anonymous job seekers via Facebook, LinkedIn, and Twitter. Received the most prestigious award in Counseling from San Francisco State University, becoming an adjunct faculty member immediately upon graduation to lecture a class of 100+ counselors-in-training. Nationally Certified Counselor with the National Board for Counselor Certification (NBCC)—a credential requiring 2 years of graduate-level counselor training from an accredited institution. Certified Professional Resume Writer with the Professional Association of Resume Writers (PARW). Scored in top 1% in the country on entrance exam. Invited to join exam review board. Nationally Certified Resume Writer with the National Resume Writers' Association (NRWA). Appointed as Certification Chair for a term due to credentials, reputation, and high-quality craftsmanship. Master's degree in Career & College Counseling from San Francisco State University's CACREP-accredited graduate program. Ranked #1 in a class of 60 students, receiving the "Most Distinguished Scholar" award. Bachelor's degree in English from Tufts University in Medford, MA. Received scholarship for Writing and Fine Art. Previous career as a lead recruiter based out of Silicon Valley. Collaborated with 200+ hiring executives, HR staff, and in-house recruiters on their wants, needs, demands, and preferences in looking for qualified employees. Well-honed expertise in coaching job seekers through all phases of the hiring process. Cliff Flamer. 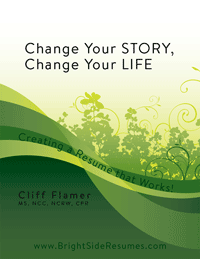 Author of the book about creating a resume that works. Joyce Lain Kennedy. Selected as 1 of 5 career experts whose resume *and* cover letter appears in this series. Louise Kursmark. Selected as 1 of 40 writers whose samples appear in this publication, out of 1700+ resume-writer candidates. Cliff Flamer, Career Planning & Adult Development Journal, Vol. 21, No. 4. We'll show you how compelling it can be. We elevate the careers of positive, passionate people of all experience levels: senior executives, managers, entrepreneurs, employees, technologists, consultants, and aspiring professionals. We welcome opportunities to work with women, people of color, members of the LGBT community, and champions of inclusiveness who seek well-deserved positions of visibility and influence. When we embrace varying perspectives and life experiences, we increase our capacity for innovation, empathy, and problem solving... which is good for business. And good for the soul. Cliff's dad, in watching him do things his own way as a child, came up with a mantra that quickly stuck as Cliff's family nickname: “Clifford B. Clifford.” Or “Clifford B.” for short. He started to make it a point to do things differently. In his Connecticut high school, Cliff won “Class Individual" after taking on roles as an ostentatious varsity scholar, a renegade mathlete, and a mulleted hip hop dancer. Senior year, he won a writing and art scholarship to Tufts University. He still had no idea what he wanted to do, which was starting to freak him out. 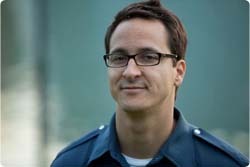 At Tufts, Cliff confirmed a talent in writing. He spent hours thinking about his characters' heartache and motivation; he loved toiling over the last paragraph of a good story. It was inspiring, but he hated the idea of giving up Math and Computer Science to become an English major. At 2am one morning, Cliff scribbled down a business plan for a different kind of career service, laden with levity, optimism, and authenticity. Within the first year of launch, he realized that when people talk about work, they talk about their entire lives. Things got deep quick. It was time for more training. Cliff got his MS in Career Counseling from San Francisco State where he discovered using storytelling as a means of therapy. A day after his first daughter was born, he graduated at the top of his class with a few awards and some mighty fine ideas about how to use the resume process to transform peoples' lives. Cliff began changing peoples lives through their resumes, topping the industry as "The World's Best Resume Writer.” BrightSide experienced unprecedented growth, which led to the hiring of 10 writers and a fleet of editors. But, even with all this success, Cliff knew something wasn’t quite right. Cliff missed engaging clients directly and noticed the quality of work was dropping. Against the advice of nearly everyone, he scaled back the team to a few editors, a super-powered assistant, and some back-office heroes. Customers loved the ultra-personalized service and BrightSide had its best year ever. Cliff enjoys meaningful conversations every day. He's using his counseling skills, recruiting background, literary training, artistic sense, love of storytelling, compulsion to innovate, and analytical mind to get people closer to where they need to be. He does what he loves... with passion and authenticity.